DANSVILLE — The Livingston County Sheriff’s Office announced a multi-agency child car seat check and announced the date for their next child one. According to a press release from the Livingston County Sheriff’s Office, on Saturday, June 24, from 10 a.m. to 2 p.m. there was a Child Car Seat Check Event at Wentworth Motors, 131 Franklin Street, Dansville. 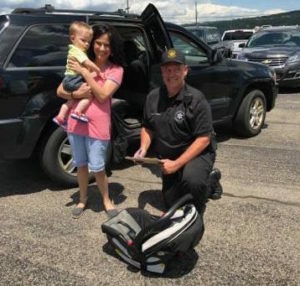 “Through the efforts of Certified Child Seat Technicians from Sheriff’s Office, Cornell Cooperative Extension, the Nunda Police Department, and the Mt. Morris Police Department, a total of 35 Car Seats were checked resulting in 17 new Car Seats being issued to children at no cost,” said Sheriff Thomas Dougherty. The Sheriff’s Office says that child seats, including booster seats, and safety belts these help save kids’ lives. Motor vehicle crashes are the leading cause of death for children age 4 to 14 years old. Eight out of ten child safety seats are improperly installed. A child of age 4, 5, 6 or 7, must use a booster seat with lap and shoulder belt or a child safety seat (the child and safety restraint system must meet the height and weight recommendations of the restraint manufacturer). The next scheduled Child Safety Seat Check is Saturday, July 22, 2017 at the Livingston County Highway Department, 4389 Gypsy Lane, Mt. Morris from 10 a.m. to 2 p.m.